Every week over 5 million people attend one of the 5,000+ multisite churches across North America. Truly multisite has become the “new normal” for healthy, growing, outreach-oriented churches. Although every multisite church has a unique “church-print” there are some best practices emerging from the multisite movement. Learn what’s working from multisite pioneers Jim Tomberlin and Wade Burnett at the Multisite Best Practices Bonus Session at Exponential West, Oct 5 from 1-5pm. Multisite changed how we think and do church, but very few multisite churches are really maximizing the multiplication principle inherent in multisiting. They are adding campuses more than multiplying them. The multisite church movement is approaching another paradigm shift that will change how we think and do multisite. It is being fueled by a small but growing number of radical churches who birth multisite campuses, plant churches and keep a multiplication scorecard. 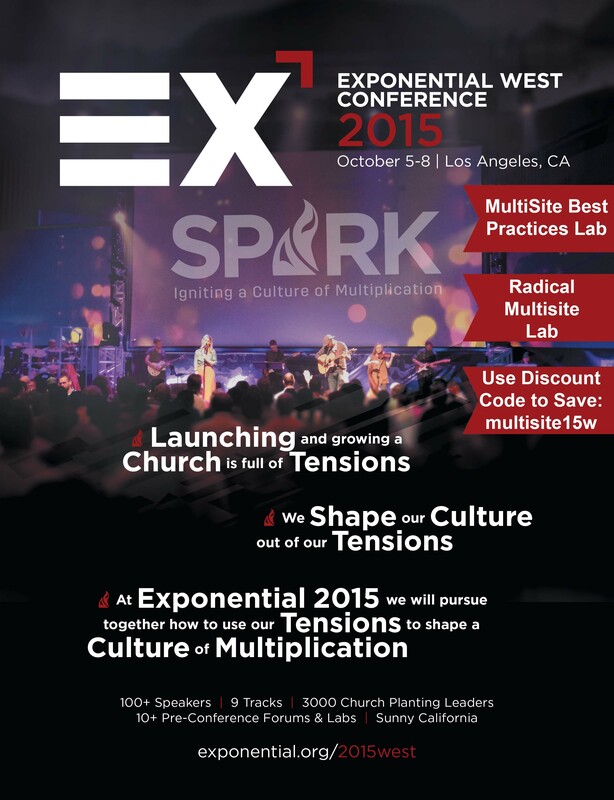 Learn more about radical multisiting with Jim Tomberlin and Wade Burnett at the Radical Multisite Lab at Exponential West, October 6 from 8-11:30am. Make sure you are there by registering for the main conference + pre-conference with code: multisite15. You will receive $30 off of your conference registration and a FREE pre-conference as well as access to Bonus Sessions. Register here! Signup for the Multisite Best Practices Lab and/or the Radical Multisite Lab with this code multisite15w and get a discount when you register. Learn more about MultiSite Solutions here.